Got 15 Minutes? 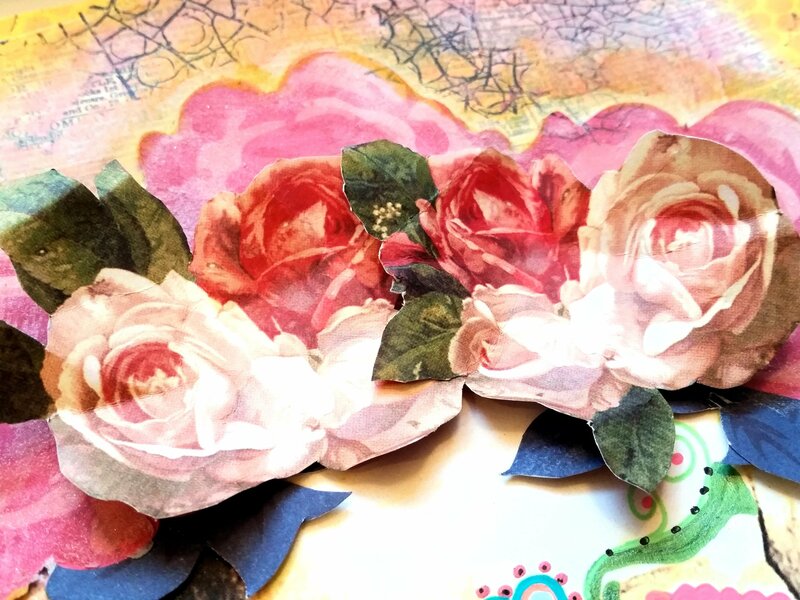 Create Mixed Media! I get asked a lot, “how do you find the time to do art”? I try to create art every day. 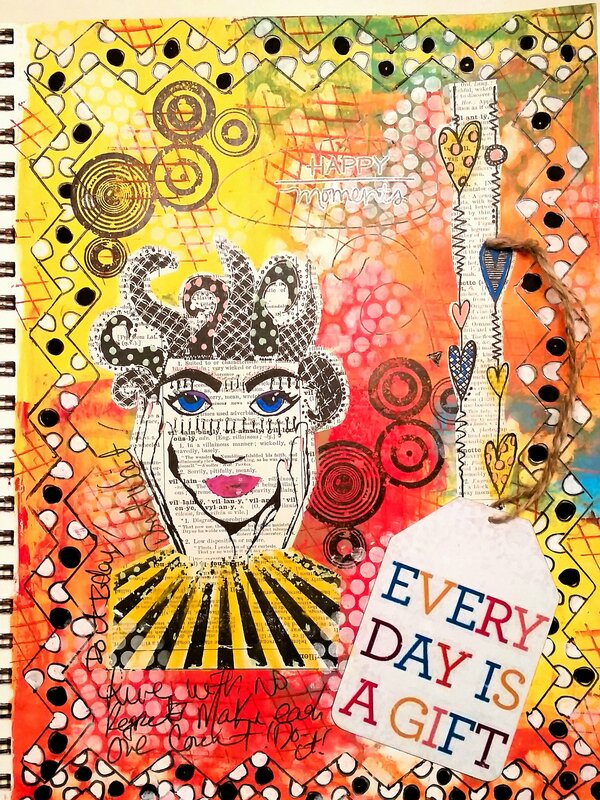 Whether it’s creating a layout in my art journal, practicing face sketching or just laying some backgrounds for future use, I do my best to allow myself that creative time each day because it’s good for my spirit. Art makes me happy, relieves stress, and through the process of self-expression, art has helped lead me to some insightful conclusions about myself. So how do I find the time? My short answer is that I make the time, I just don’t always have a lot of it. Sometimes all I have are a few minutes before work, but I assure you that you can do a lot with 15 minutes and I’ll share some tips so that you too can maximize those few minutes that you can carve out between work and family life. 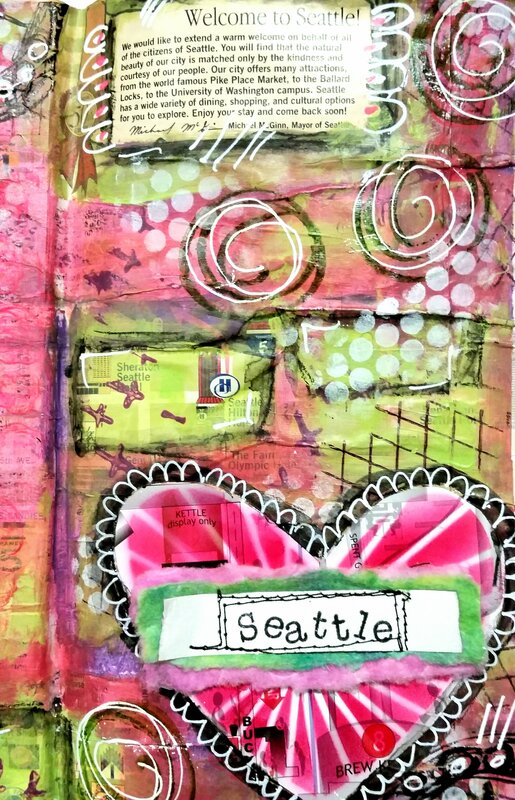 When I have 15 minutes for mixed media I usually work in a 5.5 x 8 Strathmore journal, like this one HERE, but you can choose to work in whatever sized journal you’d like. It doesn’t even have to be a journal. 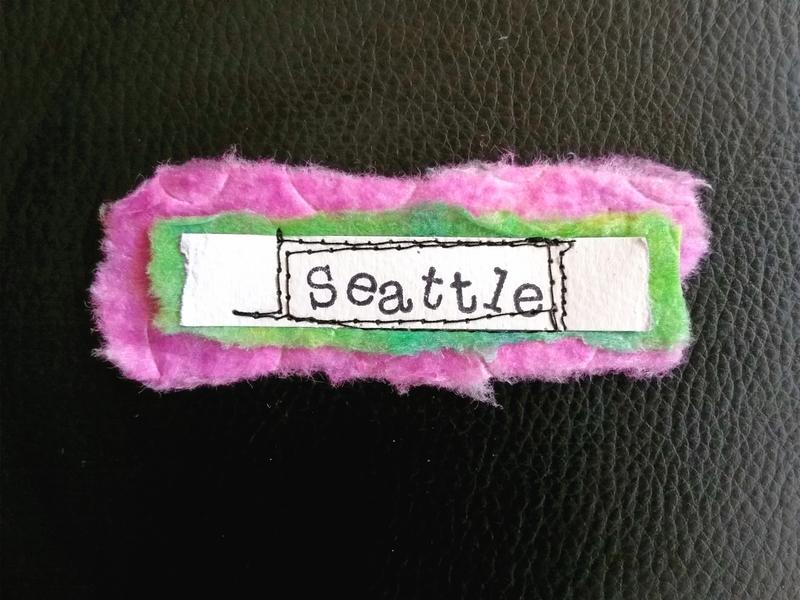 It can be an ATC, an index card, whatever you’d like. Generally, I’ll work with just 2 or 3 colors for the sake of time. In this example I used red, yellow and orange. I set my timer for 15 minutes and begin. I don’t feel rushed, I just do what I can in the time that I have. To prep the page I scrape some gesso on with an old gift card. I apply my base layer of paint in the same manner, then use a dry brush to blend. Applying in thin layer allows for fast drying. Typically, by the time I’m done blending one side of my page, the other has already dried. Side note: because I’m using such thin layers of paint during this process, I use mainly Dina Wakley media paints because they offer good coverage and are deliciously vibrant. I use rubber stamps, such as the ones from Paperbag Studios that I used here and various pens to make doddles and marks. If I’m going to journal, I add just a few words in disguised handwriting, rather than lots of writing or worrying about making it fancy. 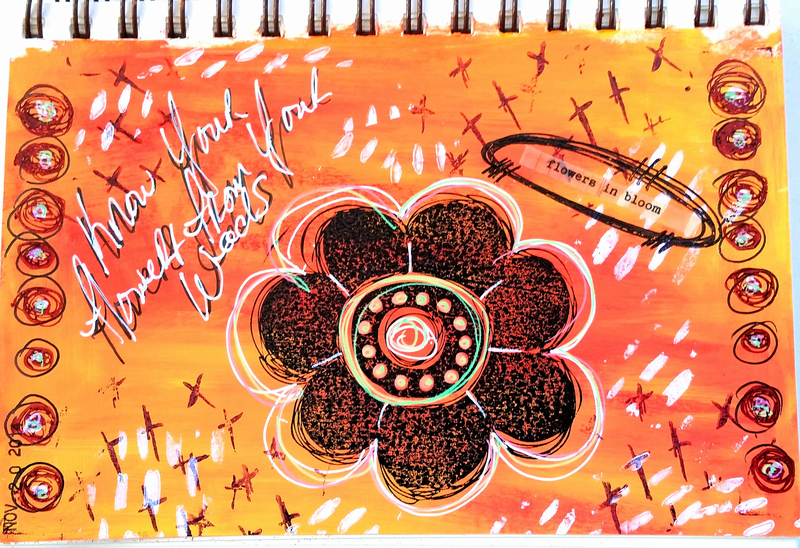 Another tip is to clean off your brayer, paint brushes, even your stencils onto your blank journal pages when you’re arting, so that when you sit down to 15 minutes of mixed media, you aren’t starting from a blank page. I do this mainly in my face sketching journal, but it sure comes in handy. 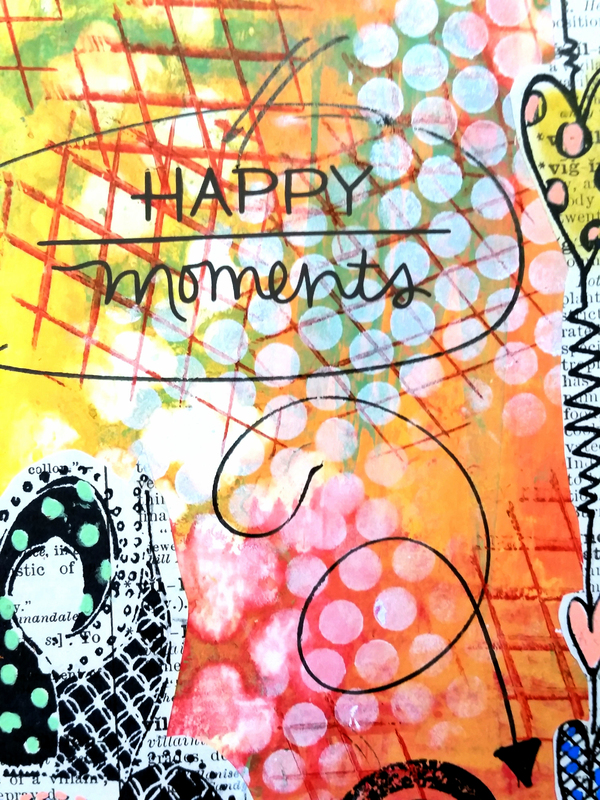 With these few simple tips, you too can create mixed media art in just a few minutes! 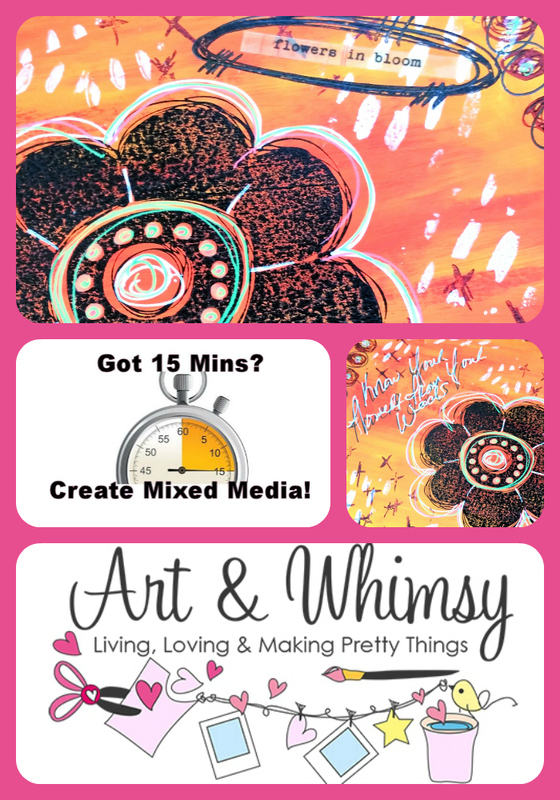 I was first inspired to create in just 15 minutes by the very talented Rae Missigman. If you haven’t already done so, I encourage you to check out her blog and videos which can be found HERE. You’re sure to be just as inspired as I’ve been to see the magnificent things she can accomplish in just 15 minutes; she’s amazing! Oh! 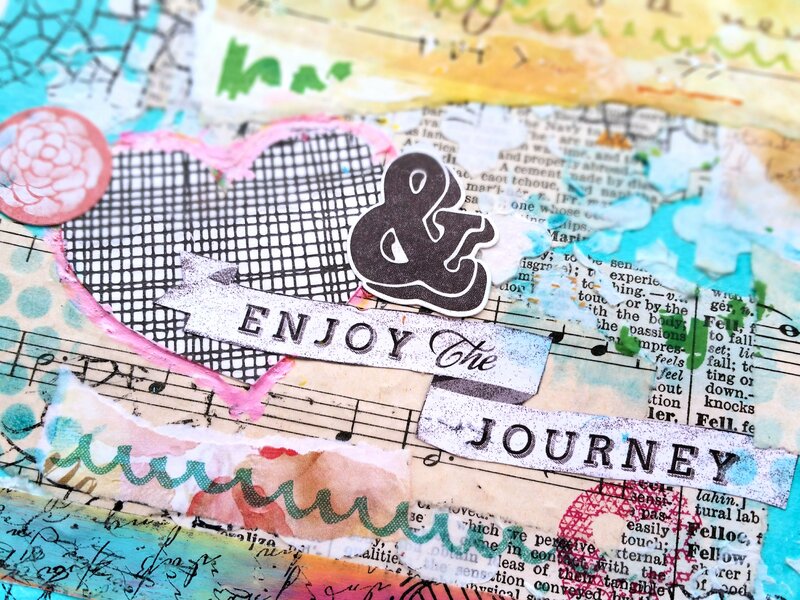 While you’re there, check out her new rubber stamp line, NATURAL ELEMENTS, they are fantastic and sure to be a great addition to your mixed media projects. 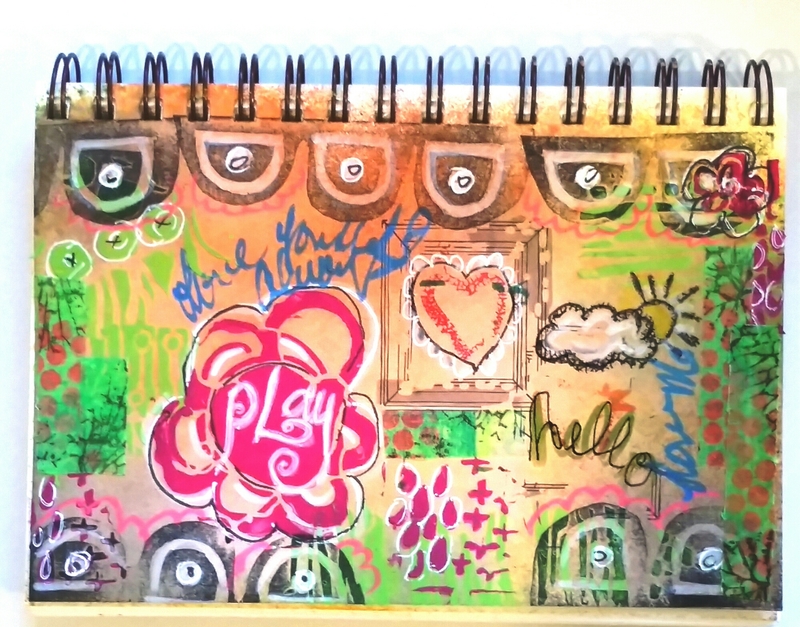 I created this art journal entry on Thursday morning before heading to the office; it took me just under 15 minutes. By the time I was done with this layout, I felt energized and ready to face the day. I find that, for me, these few minutes in the morning really help set the tone for the rest of the day. I encourage you to give it a go, I think you just might be surprised at what you can do with just 15 minutes. Enjoy and Have Fun! I recently had to undergo some medical procedures and wait, not so patiently, for the results. It was a difficult time and try as I might to not think about it, sometimes the fears and worries would start to take over. The results are in and while I still have some things to take care of, the major scare is over, but this post isn’t about that. It’s about my profound sense of gratitude. I’m thankful to be able to pursue my creative passions and more grateful than ever that my Beloved not only supports me, but encourages me to turn to my art during those times when I need to soothe my restless spirit. I spent a lot of time in my art studio during those days of waiting, often times with no other intention than to just keep busy, to not think. And while Patrick is incredibly supportive and offers me a great deal of comfort, there were times when I just needed to lose myself in my art for a while and that’s something he understood. It’s just one of the many reasons I love Him so. 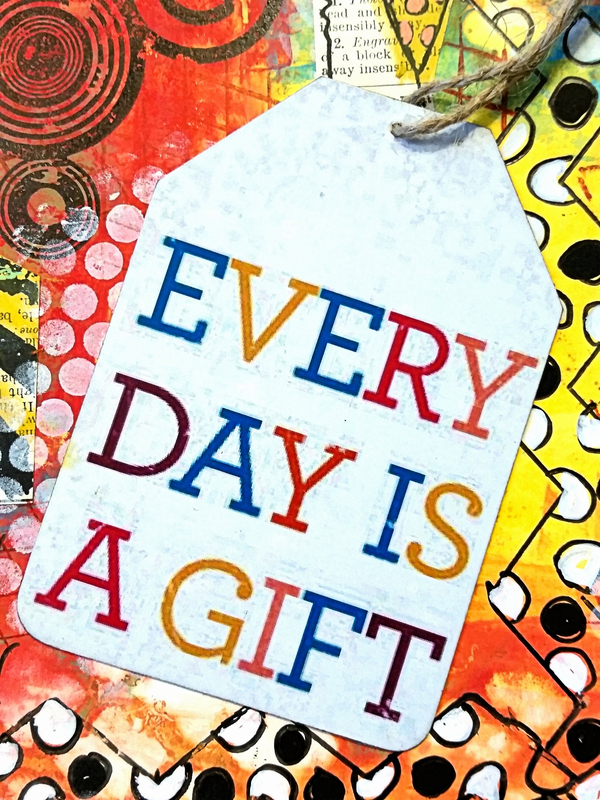 Yesterday I received a gift at work that had this “Every Day Is A Gift” tag attached and it really resonated with me so I went home and sat down to play in my journal. 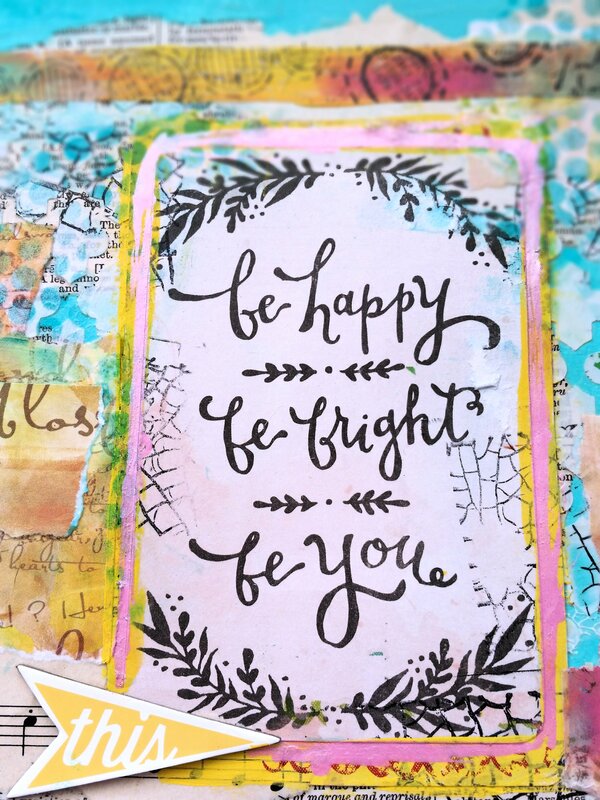 The only thing I knew was that I wanted to incorporate the tag, the rest just developed from a combination of stamps, doodle, paint, a love of art journaling and a whole lot of gratitude. My recent scare and this tag is a great reminder that Every Day Is A Gift and I plan to live each one of them Out Loud! As I previously shared, I’ll be participating in Life Book 2015, beginning Jan 1st. After exchanging a couple of messages with Tam and confirming that painting faces is a significant portion of Life Book, I decided that I would learn to draw a face. Enter Dina Wakley. 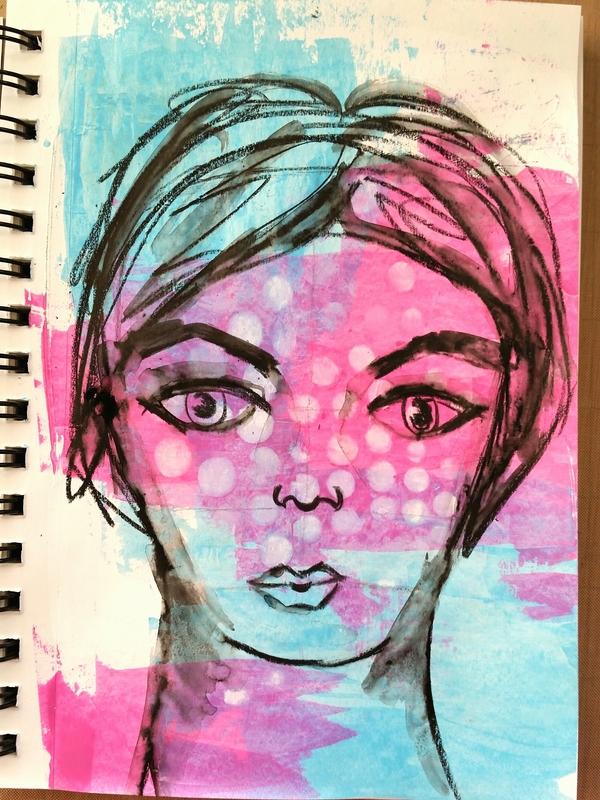 It’s no secret how much I love, love, love her acrylic paints and stamps or that I’m her #1 fan girl, but I’m also really drawn to her scribbly style faces and their vibrant splashes of color. So I contacted her to see if she’d be in San Diego anytime soon. I struck out there, but she did tell me about her online class called “Facing the Facts”. In it she offers great tips, talks about common mistakes that beginners tend to make and offers ways to correct them. She also says that getting good at faces, or anything really, takes practice and encourages us to commit to 100 faces, beginning with our first face that we’re to sketch before watching the first video. So I did. I got my reference, just like she suggests and gave myself a couple of minutes to sketch it. 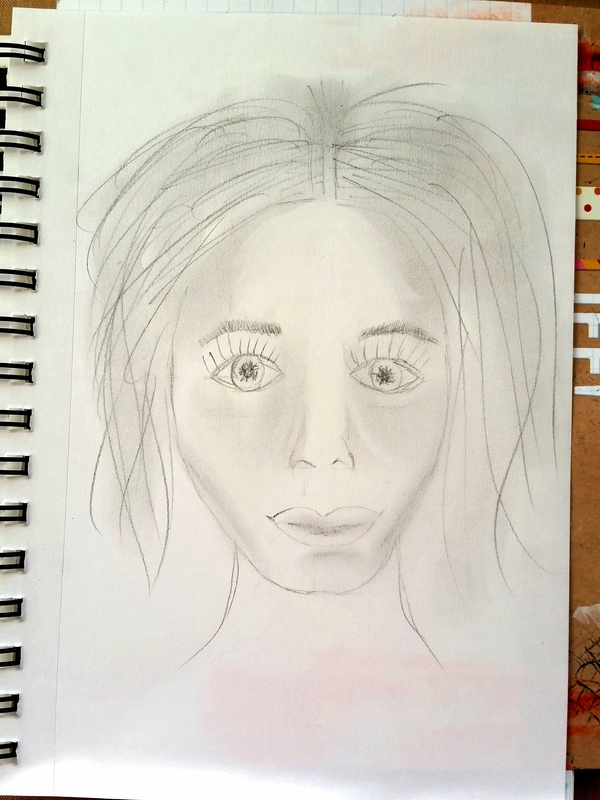 After I sketched her I watched Dina’s first lesson and listened to her talk about those common rookie mistakes like my “joker’s mouth”, “overdrawn hair” and the dreaded “fully visible iris”. In short… YIKES! But hey, no worries, right? It’s only face #1 out of 100… 99 more opportunities to improve. This morning I decided to sketch face #2, using the tips offered in Face the Facts and can already see improvement. Ok still lots of room for improvement, but wow, what a difference already! I’m seriously glad that I decided to take Dina’s class and recommend it to anyone. 98 faces to go and I’m looking forward to seeing my development documented in my sketch book. 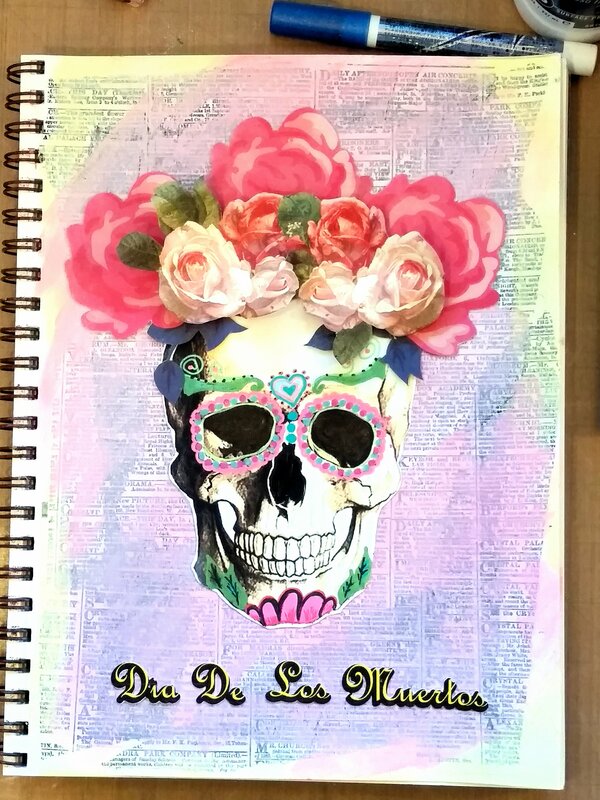 Although it wasn’t a day that I celebrated growing up, I’ve always been drawn to the design aesthetic of Dia De Los Muertos in art and fashion. With the holiday just a few days away, I see creative inspiration all around me and am thankful to have the freedom to express that appreciation for the celebration in my own art. Yesterday, when I received a copy of the San Diego Symphony brochure in the mail, I just knew there was a collage in the making. I created this one using a cut-out from the brochure, Ranger Dyan Reaveley’s Dylusions Inks, one of her stamps, my October stencils from Stencil Club, designed by Mary Beth Shaw and the Scratches texture stamp by Darkroom Door. 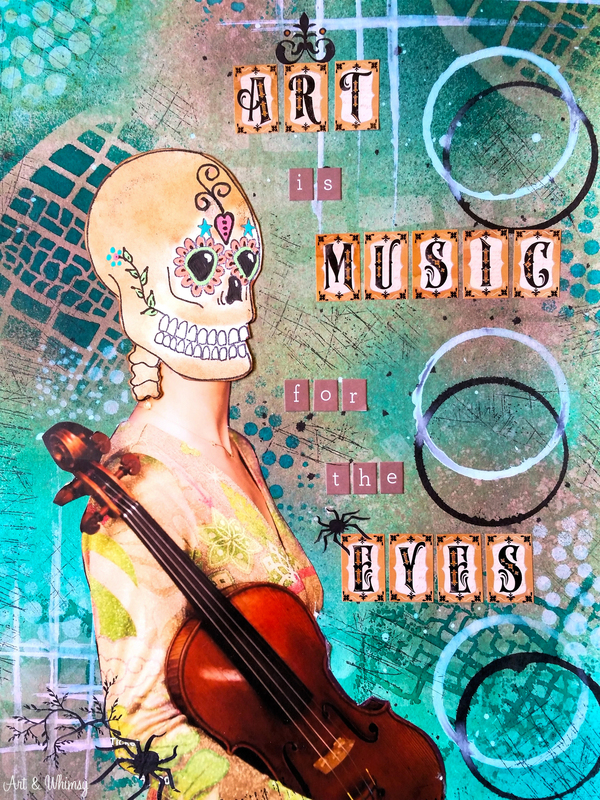 Using a blending tool and distressed inks, I gave my violinist’s skull an aged look and spruced her up for her big night at the symphony using gelly roll pens. For the sentiment I used gothic style letters that I picked up at a local store and some rub-ons, for added visual interest. I was inspired to create this by Calavera Catrina, a famous work of art by Jose Guadalupe Posada who was originally created by him as social satire. She became an icon of Dia De Los Muertos or Day of the Dead, a holiday that originated in Mexico but is now celebrated in many parts of the world. 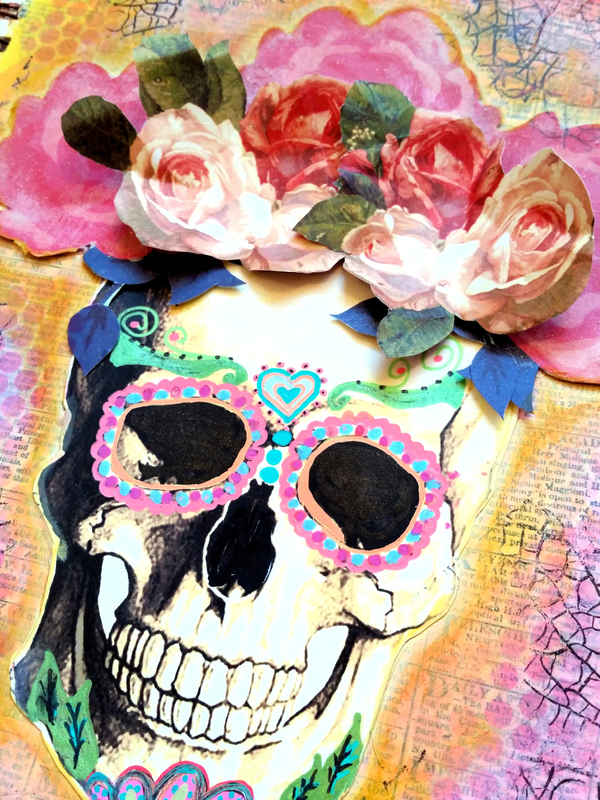 Dia De Los Muertos is a time to rejoice in memories of loved ones who have passed. 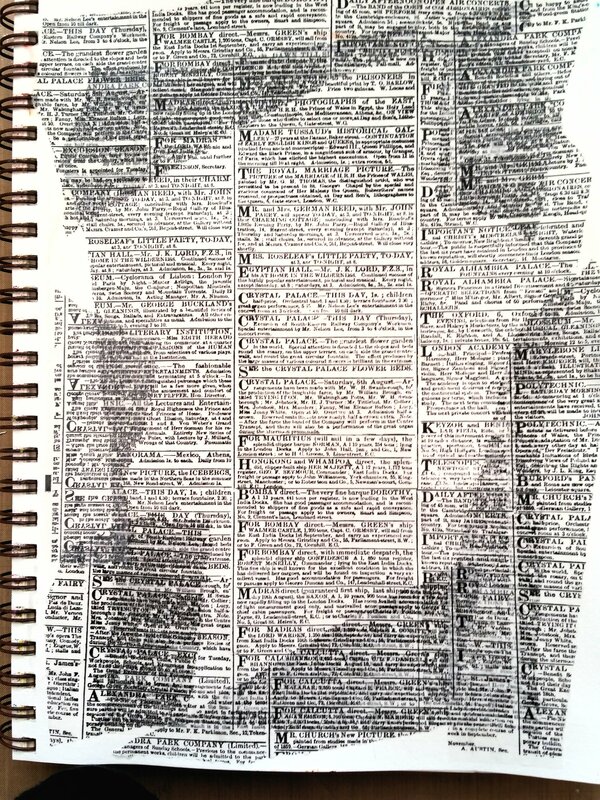 I started with a base of tissue paper “newsprint” and fluid medium. 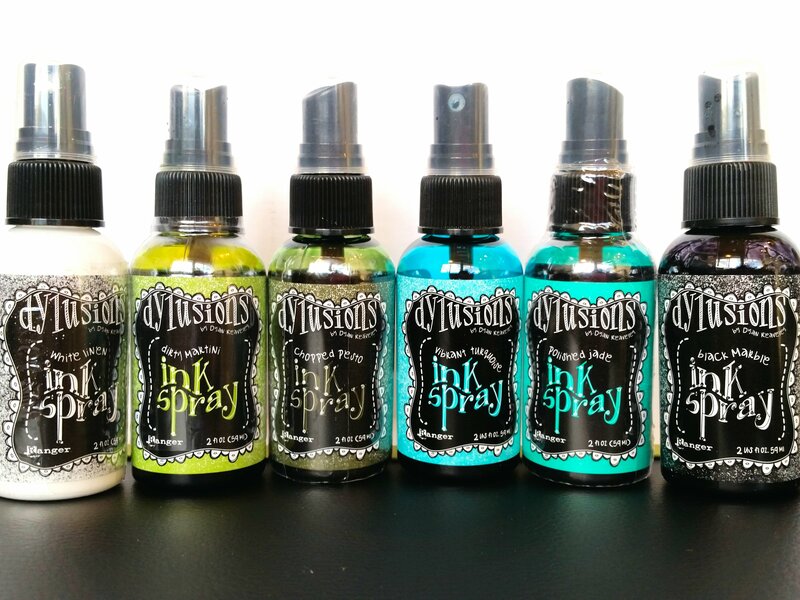 Next, I mixed up some “Chalk It Up” chalk dust into my chosen colors of paint and gave my page a light wash. 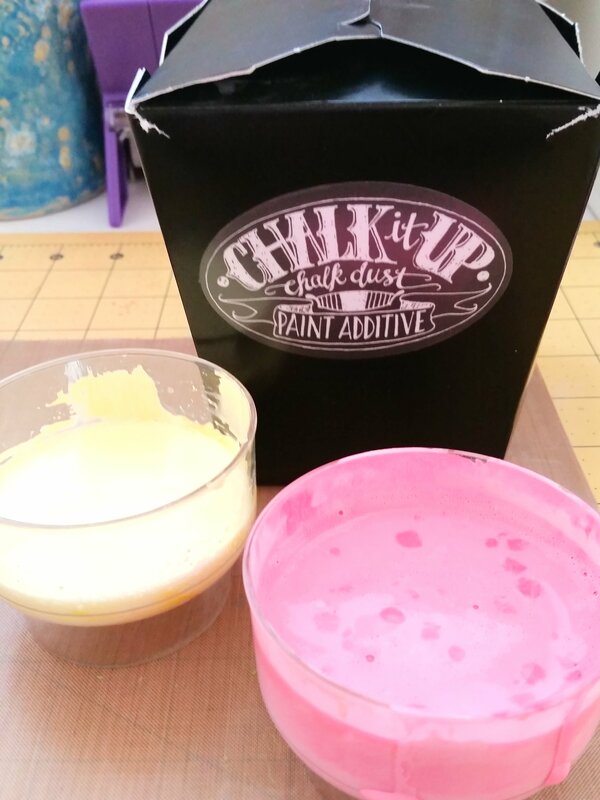 I love this stuff, it makes your paint into chalk paint and can be used on many different surfaces. I used it here to create added texture to my page. I printed a skull that I liked off the internet onto 110 lb cardstock and gave it a coating of sealer so the ink wouldn’t smear. 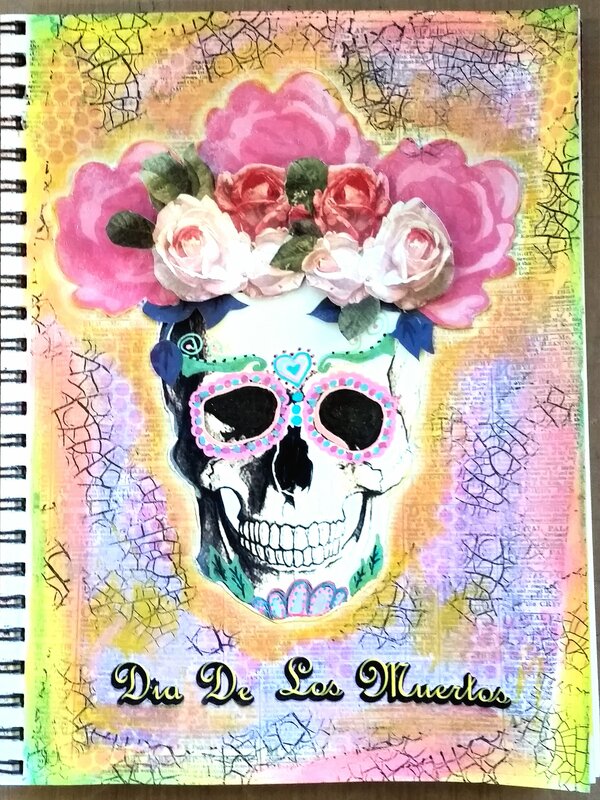 When it was dry I painted the sugar skull face using my Posca Paint Markers and cut out some roses from scrapbook paper, giving them some dimension by crumbling up the top later of roses in my hand. For the lettering I turned to my trusty Silhouette Portrait. For the final touches I used gelatos, my favorite crackle stamp by Dark Room Door and dabbed some ink on through a piece of punchinela. 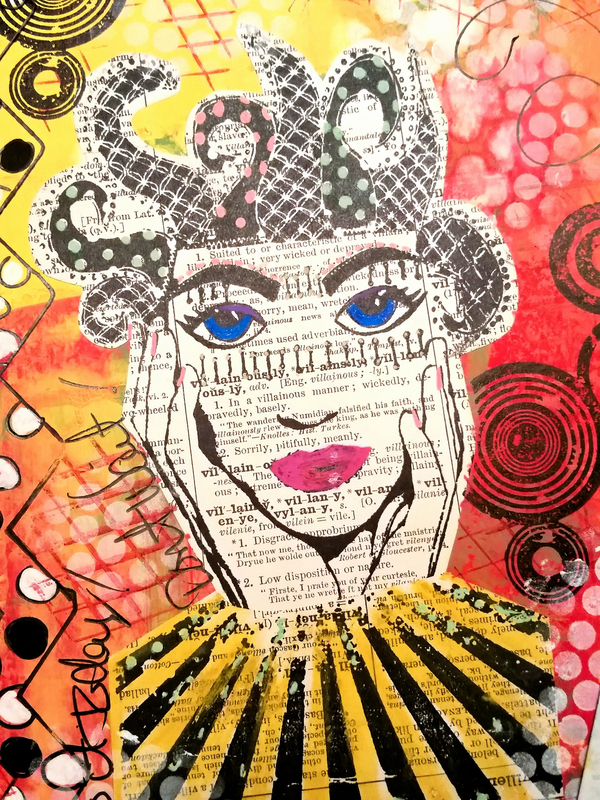 This morning I sat down for 15 minutes of mixed media before work using colored modeling paste over a #TraciBautista stencil, acrylics, homemade washi tape, rub-ons, a handcarved stamp and a couple pens for doodling. Getting that creativity flowing is a fabulous way to start the day! 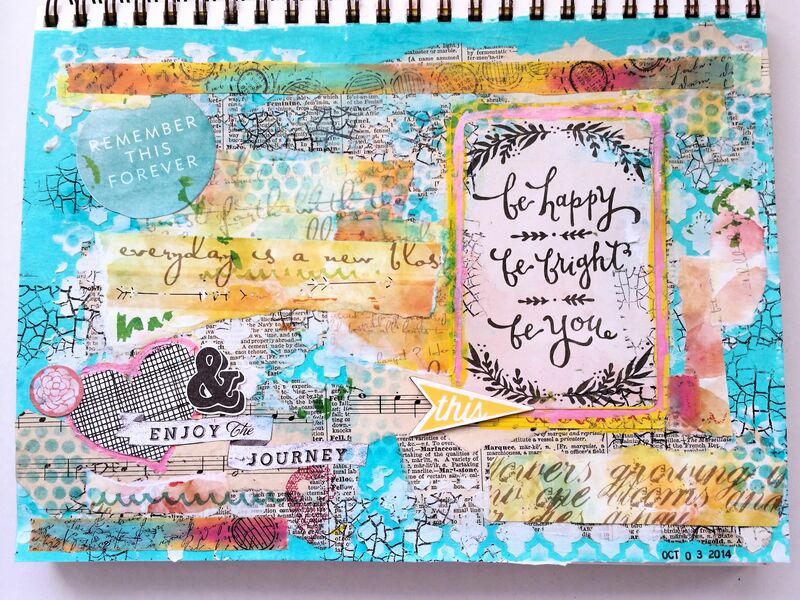 The process of art journaling, for me, can be very therapeutic. 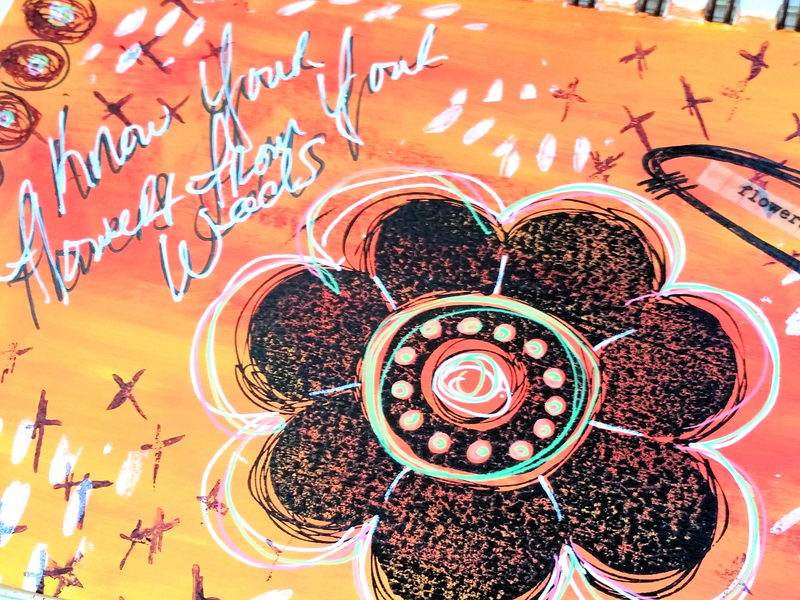 It’s something I can turn to when I need to explore emotions or experiences that are bigger than me and I find that more often than not, by the time I’m done, I’ve managed to work through the issue, leaving it behind on the pages of my art journal. This week I’ve been exploring some old baggage that I’ve been lugging around for quite a while now, so after a tough week, a little Friday night art therapy was definitely in order! 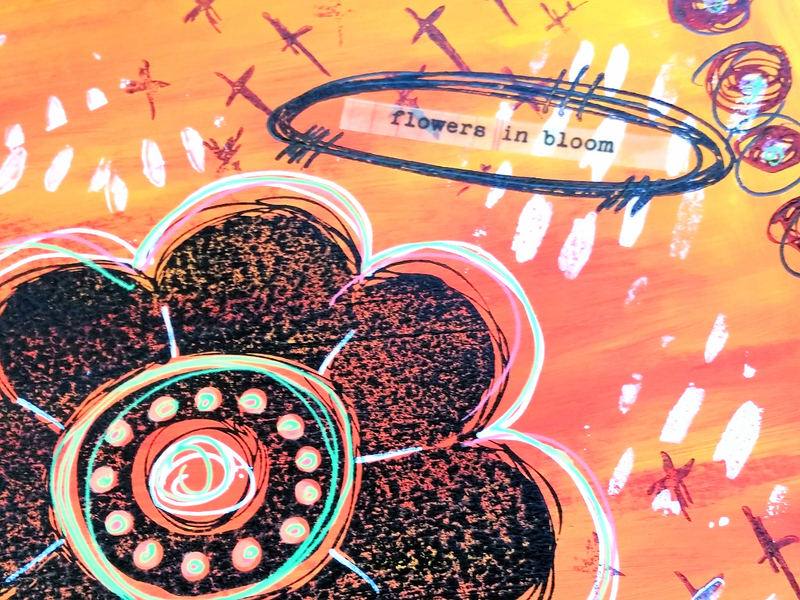 I started by scraping on a layer of Dina Wakley’s media acrylic (I LOVE her paints) in turquoise into my journal with an old gift card and adding some texture by using a pallet knife to spread modeling paste over a stencil. Once that was dry, I used fluid medium to adhere layers of torn paper and a few embellishments, to give the page movement and create even more texture. I finished it all off with some stamping, strips of my own homemade washi tape, and a few doodles using Posca metallic paint pens, which are awesome, by the way. This was a fun page for me, I like how it turned out and best of all, I walked out of my art room feeling brighter and just a little bit lighter yesterday.